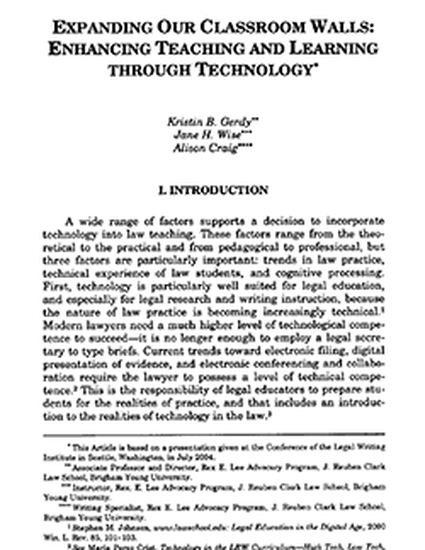 The authors examine the reasons why law faculty should implement technology into the legal education experience, provide a brief overview of the learning theory supporting technology, discuss the thoughtful use of technology, and describe four specific projects they have used in their classrooms to aid in student learning. Gerdy, Kristin and Wise, Jane H. and Craig, Alison, Expanding Our Classroom Walls: Enhancing Teaching and Learning through Technology. Legal Writing, vol. 11, p. 263, 2005. Also available at SSRN: https://ssrn.com/abstract=970674.